Local history is not something that is separate from history in general, though it appears to many people quite different from the subject as it is taught in most schools. All history is about people. Local historians, who concentrate on individual towns and villages, spend most of their time investigating ordinary people in ordinary places. The ordinariness is important and is one of the attractions of local history. It also makes it difficult to define. For the purposes of this guide, it might be said that British local history covers every conceivable subject which can be studied in a geographical area smaller than the country or countries as a whole. It includes everything from the history of individual houses, families and streets, to whole regions. British History Online (BHO) provides access to a large number of sources for British local history from the 11th to the 19th century. While a particular strength is the history of London, there are significant records for other towns and cities and for the suburban and rural history of the English regions. Currently, the local histories of Scotland, Ireland and Wales are not represented as strongly as England, but there are nevertheless some key sources for those parts of the British Isles and BHO is actively trying to expand its coverage of those countries. A number of sources searchable through BHO reflect the growth of the 'antiquarian' tradition of local history writing from the 17th century onwards. Much of this focused on landownership and inheritance, alongside the development of estates and great houses. Examples include Daniel Lysons's Environs of London (1791-6), which contains rich detail for Surrey, Middlesex, Essex, Hertfordshire and Kent. Four volumes of Lyson’s Magna Britannia (1814-22) are also available, covering Cornwall, Cumberland, Derbyshire and Devon. Other examples are histories of individual counties like Francis Blomefield’s An Essay towards the History and Topography of Norfolk (1805-10) or John Throsby’s republication of Thoroton’s History of Nottinghamshire (1677, republished 1790-6). If you are interested in the activities of the aristocracy and the gentry at a local level, various classes of Calendars—for example of medieval Close Rolls, or of State Papers from the 16th century onwards—offer an enormous amount of valuable material. Property deeds, such as those in the Catalogue of Ancient Deeds descend a little further down the social scale in showing the transmission of property within and between families, as do the Feet of Fines which are calendared for several counties, including Yorkshire and Lancashire. These record final agreements in legal disputes, usually over land. These are supplemented by will collections such as those for Lincoln. Lewis’s Topographical Dictionaries provide brief accounts of parishes and townships for not only all of England but also Scotland and Wales from the mid-19th century. Records referring only to trade include the Gazetteer of Markets and Fairs for England and Wales down to 1516 which provides a useful overview. Further details can often be found of the economic life of communities among the sections on economic life in the Victoria County History. Some specific examples can be found elsewhere, notably for London, but also for Bristol, included in the Bristol Town Duties, a summary of the grants and governance of the port of Bristol from the Middle Ages onwards. If you are interested in the development of the buildings in your community, then consult BHO's materials on the built environment, which include reports of the Royal Commission on Historical Monuments in England for various counties. These Royal Commission surveys were designed to assess the type and state of preservation of the historic monuments of all kinds, from cathedrals to market crosses. For London, there are also publications from the Survey of London, which is gradually building a similar record for Greater London. Coverage of buildings in the Victoria County History is generally confined to the parish church for most rural communities. For towns—such as Bampton and Weald (Oxfordshire) or Glastonbury (Somerset)—and cities—such as Worcester, Birmingham or Chester, Victoria County History has quite detailed coverage of the built character—that is the layout, type and age of buildings—of the communities. Victoria County History gives details, including the history and architectural detail, of vernacular and public buildings, as well as of churches. The antiquarian tradition was continued in a more recognisably modern form from 1899 in the red volumes of the Victoria County History (VCH). The VCH was founded as a private enterprise, with the intention of producing a history of each English county to a standard plan which, in the words of Arthur Doubleday, the founding general editor, made ‘a special feature of general articles which should bring into prominence the main characteristics of every phase of county life’. From 1932 to the present it has been under the wing of the Institute of Historical Research and is still producing 3-4 red volumes each year. The volumes are laid out according to a standard format and generally begin with the earliest comprehensive survey of England, Domesday Book (1086) and continue to the ever moving present. The standard plan of a parish history consists of an account of the topography and archaeology of each parish, followed by an account of land ownership in each parish land ownership, which in effect gives a genealogy of the land owning classes and organisations in each parish. Religious and economic history and in the case of more recent volumes, the social history of each parish or town. Inevitably, much of the content of the VCH is concerned with rural communities but it also includes significant regional centres such as Chester, Cambridge, Birmingham and Swindon. The majority of the VCH volumes can be found on BHO. The coverage is confined to England, and some counties—notably those on the east coast—have only one or two volumes. In such cases these are generally accounts of the topography or medieval religious houses. While BHO has particular strengths in the history of London, it also contains records of the major cities of Wales and Scotland. These sources can be divided between calendars of original records and antiquarian records. In the former category are the five volumes of Cardiff Records which include records of civic government, land ownership and administration from the 12th century through to the 19th century as well as records of individuals, notably wills, from the late 15th century to the middle years of the 18th. The nature of these collections is eclectic and they are not comprehensive in the same way that the calendars of government records are. For the two principal cities in Scotland, Records of the Burgh of Edinburgh and Records of the Burgh of Glasgow fulfil a similar function from the 16th century onwards. Earlier Glasgow records are also available. The various parish entries of the Victoria County History contain architectural accounts of many parish churches and accounts of the life of the parish church and nonconformist communities. Some, such as the VCH volume for Stepney and Bethnal Green, reflect the diverse network of faith communities found in the modern cities. Most counties have part volumes of the VCH describing the medieval religious houses and these are supplemented by the assorted monastic and cathedral records found under the Religious heading. These include monastic annals and cartularies (collections of charters) for religious centres around England. The prominence of material and resources specifically for the City of London can be contrasted with the more patchy coverage of other localities, and especially those in Scotland and Wales. The bulk of the material for local history is contained within collections dealing with particular kinds of sources (notably administrative and legal, and economic) or antiquarian assemblages. The latter material tends of be of a more eclectic nature, and so search results will vary considerably. If your area of interest is covered by the Victoria County History then this may well be the easiest place to begin. You might like to supplement your searches with other online resources such as Discovery, the catalogue of The National Archives, local archive catalogues or, in the case of Wales and Scotland, appropriate county or area histories. Searches for place-names can be carried out either using the global search box, or by searching individual documents. Spellings of place-names vary, and this should be borne in mind when searching. 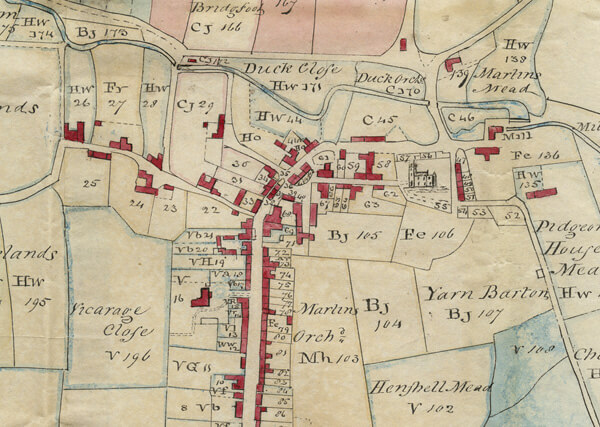 The wide-ranging nature of local history means that there are many possible keyword searches, including searches for people, local courts ('manor court' etc. ), buildings, occupations, property transactions, and topographical features such as rivers and canals. Searching for individual people is inevitably more complicated and you will need to consider variants in spelling and the vast period covered by the resources available. Unless you already have specific evidence to the contrary, two people with similar names mentioned more than 50 years apart are likely to be different. The Oxford Companion to Local and Family History, ed. D. Hey (2nd edn., Oxford, 2008). See a full list of external resources that we recommend for further research.